If you’re starting to notice a drastic difference in the results of your corporate recruiter compared to a third party recruiter’s results, you are more than likely not alone. It always amazes me at how differently a corporate recruiter’s job is viewed versus a third party recruiter’s job. This difference contributes to the type of corporate recruiters companies hire, job expectations, as well as the recruiting results. When it comes down to it, recruiting is recruiting. Regardless, you need to have the same tenacity, drive, and sense of urgency in order to be successful in any recruiting role. So, if you are wondering how to work with a corporate recruiter that will match the amount of ground your third party recruiter is covering, you should consider your views on these types of recruiting, as well as your hiring habits and performance expectations. One of the main differences I notice when people describe a corporate recruiter’s job versus a third party recruiter’s job is the fact that most people believe that a corporate recruiter does not have to work as hard at finding top talent. The simple fact that the corporate recruiter is working directly for the company he or she is recruiting for is often seen as a way to easily bypass the constant candidate marketing, sourcing, and candidate selling that a third party recruiter needs to do in order to be successful. This is an incorrect assumption! After all, if companies did not need someone chasing down top talent, there would be no need for staffing agencies. No matter who you are recruiting for, top talent will not willingly show up at your doorstep for a job. A third party recruiter is typically paid based on placements achieved and quite often, candidate retention rate factors into their fee. For this reason, a good third party recruiter is going to be making the most of any and all sources available in order to identify the right fit for your need. These recruiters will tenaciously call on passive candidates, regardless of how difficult it is to find them or no matter how many times they are hung up on. A great third party recruiter will religiously build a referral pipeline and proactively recruit for expected future openings. Most importantly, a successful third party recruiter leaves no stone unturned. If you want a corporate recruiter who can match up to the results of a third party recruiter, you need to modify your job requirements and interviewing methods. Your corporate recruiter needs to be well versed on social media, job boards, and other candidate marketing sources in order to identify the best talent for you and your company. When you are hiring a corporate recruiter, think about the types of results you would expect from a third party recruiter and interview for those results. Find out what type of recruiting experience the candidate has had in the past. Is this candidate driven to find the perfect candidates, utilizing every source available and leaving no rock unturned? If so, then this is the corporate recruiter you want on your team. I will say it again, recruiting is recruiting. While recruiting is an aspect of human resources, a recruiter is NOT an HR generalist or an HR admin. You are hiring a recruiter to track down top talent, interview and identify skilled candidates quickly for your team. In order to do this, your recruiter needs to have somewhat of a salesman approach to recruiting. If you want your corporate recruiter to provide the same results as a third party recruiter, then you need to hire a REAL recruiter and NOT an HR admin or generalist. 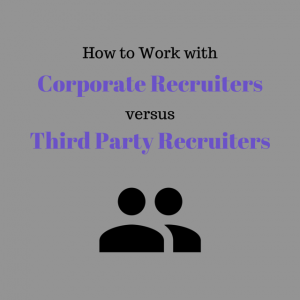 I have heard it over and over again that corporate recruiters have it easier because they don’t face the competition that third party recruiters face. While this may be true in some ways, it is a false belief in many others. The main reason most companies decide to hire their own recruiter is to avoid the additional cost in a third party recruiter who is not ONLY focused on their company’s needs. When you hire a corporate recruiter, you expect that recruiter to perform up to standards and eliminate the need for the third party recruiter. While a third party recruiter is constantly up against a plethora of other third party recruiters who are chasing after many of the same companies, a corporate recruiter needs to realize that they too are in a competition. If a corporate recruiter is not able to provide top talent with a sense of urgency, their value is quickly depleted and once again, a third party recruiter is hired. Make sure that your corporate recruiter understands your expectations and your reasoning for hiring a recruiter. Set certain guidelines for your recruiter, regarding number of qualified candidates submitted, hired, as well as retention rates. If you want your corporate recruiter to match up to successful third party recruiters, you need to hold your corporate recruiter to the same standards. After all, recruiting is recruiting, no matter who you are recruiting for. 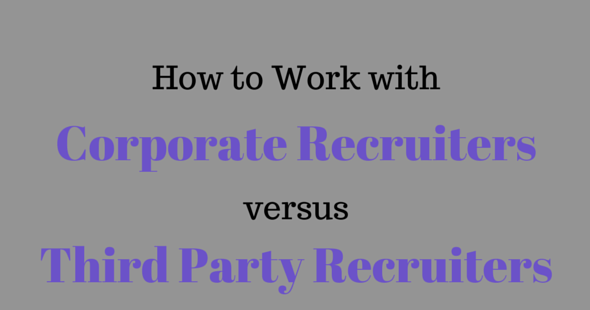 What are some other reasons why your corporate recruiter doesn’t match up to third party recruiters?